Terrestrial Energy of Canada has signed a contract for technical services with the European Commission's Joint Research Centre (JRC) in Karlsruhe, Germany. Under the contract, JRC will perform confirmatory studies of the fuel and primary coolant salt mixture for Terrestrial's Integrated Molten Salt Reactor (IMSR). Terrestrial announced today it has signed the fuel testing contract with the JRC as part of its "validation and verification programme for the IMSR power plant design now under way". The JRC is the European Commission's science and knowledge service which employs scientists to carry out research to provide independent scientific advice and support to EU policy. It draws on over 50 years of scientific work experience and continually builds its expertise based on its seven scientific institutes, which host specialist laboratories and unique research facilities. They are located in Belgium, Germany, Italy, the Netherlands and Spain. The JRC's nuclear work - funded by the Euratom Research and Training Programme - has as its objective the pursuit of research, knowledge management and training activities with an emphasis on nuclear safety and security. Terrestrial noted, "The facility will undertake the tests under conditions compliant with quality assurance protocols of nuclear codes and standards, as is required to advance a nuclear power plant design through the regulatory process." Last November, the Canadian Nuclear Safety Commission (CNSC) completed the initial phase of a vendor design review of Terrestrial's 400 MWt IMSR, known as IMSR400. 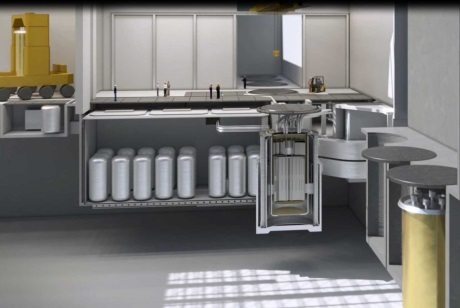 The design is the first advanced reactor to complete the first of three phases of the CNSC's regulatory pre-licensing review. The vendor design review provides an opportunity for CNSC staff to assess a design prior to any licensing activities, enabling the vendor to identify potential issues that would require resolution. Phase 1 of the review determines whether the vendor is demonstrating intent to be compliant with CNSC requirements in its design processes and outcomes. In June 2017, Terrestrial began a feasibility study for the siting of the first commercial IMSR at Canadian Nuclear Laboratories' Chalk River site. It has also said it intends to submit an application to the US Nuclear Regulatory Commission for a design certification or construction permit in late 2019. Terrestrial plans to bring IMSR power plants to market in the 2020s. "IMSR power plants will provide clean, convenient, dispatchable and cost-competitive heat for many industrial applications, including electric power provision and heat for industrial processes, such as chemical synthesis and desalination," it said.